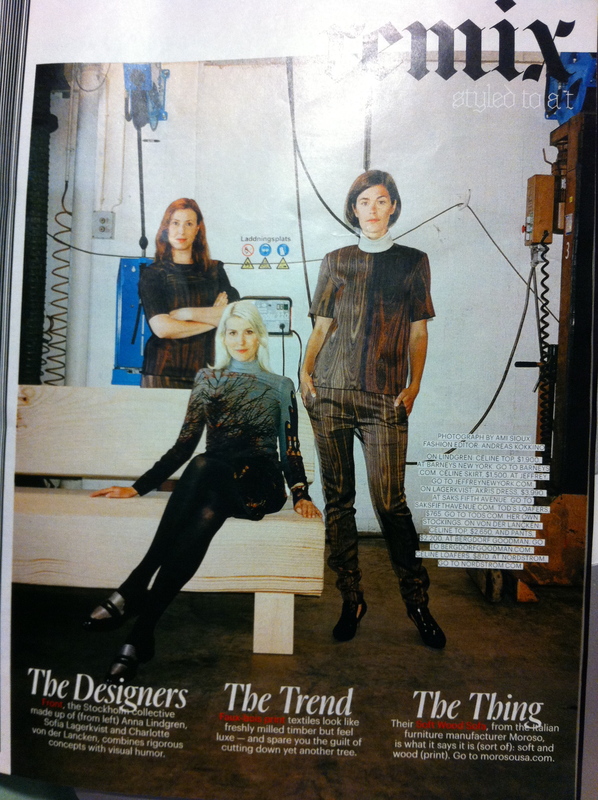 I found this article in The New York Times Style Magazine (Design Fall 2011). The photograph is of three individuals Anna Lindgren, Sofia Lagerkvist, and Charlotte Von der Lancken. Together they are the design team “Front”. Pictured with the designers is a couch they have designed which actually appears to look more like a bench, but this is an illusion. The clothes as well as the sofa in the picture appear to have a wood veneer finish but are actually printed textiles. I believe that these designers are trying to make a statement on our world’s resources. Rather than cutting down a tree, they feel that recreating the visual qualities of the wood on a textile is much more environmentally friendly. Aside from the visual qualities of this piece they have now made a comfortable sofa rather than a not necessarily as comfortable bench if this piece were actually made from two slabs of wood. As a product designer I feel as though, in this photo, these designers are attempting to bridge the gap between fashion design and product design. At first glance, I thought that the clothing and the furniture where all part of one collection but actually they are wearing pre fabricated clothing. I think that the fact that they did not design the clothing they are wearing furthers the movement that they have contributed to, being this wood veneer cloth. This is an example of how furniture and clothing can evoke trends within one another. The design process can be applied to a variety of objects, they all relate in this way. I feel as though when you are designing for any field, whether it be clothing, buildings, lighting, furniture or accessories the same considerations are taken into account. When designing anything the creator thinks about aesthetics, longevity, quality, quantity, manufacturing processes no matter the object being created. All areas of design relate to one anther whether they are physically a part of our bodies, an object we physically interact with, or an environment created by a variety of objects in a space. I found this weeks’ readings very interesting. The fist think that came to mind while reading the Mears piece was a term coined in the fashion industry as “ugly pretty.” This seems to me, unfathomable but i think that it also describes how beauty is subjective. Beauty is cultural, agist, abstract, biased, instinctive and personal. Models are depicted through this reading as leading difficult lives in industry because becoming a super star seems few and far between. Mears discusses how the richer get richer idea applies here because once one influential member of the fashion community feels that one particular model has the “look” they are in. But as Mears states that model may not actually have anything that the other girls don’t. I do not think that this is fair it is just how the industry works, beauty will always be subjective. I admire the author’s determination to enter into the world of a working model after she had left once before. I cannot imagine the tole it takes on ones lifestyle being a model. I think that models are fed a slew of contradictions they are to be skinny but not to skinny, pretty but not too pretty. I think it is also interesting how the author goes through the modeling process with the intention that she is doing it in the name of sociological research but she actually finds it hard to abandon modeling all together. So what is it about models that make us so enticed? The article by Andrew Ross “Low Pay, High Profile” brought up some very interesting things about Barneys that I was unaware of. I found it fascinating how the company is so reliant on gay culture. I think that Ross is biased and creates a stereotype about the company that some may be offended by. But I do believe that Ross just wants what is best for the workers despite their sexual orientation. As stated in the article, “service emplyees who were identifiably gay were not just a businees asset, they would become an economic necessity.” I did also find it interesting how the employees of Barneys stuck together. Their union seems solid and actually unified. For example the wearing of red at work was significant and would only be successful if a number of employees participated. The union seems to be very organized and focused and even a little out there. They are successful in that they are extreme, in order to get the attention from management they needed to be “outrageous.” I think that these workers took an alternative approach to a protest. Having a fashion show seemed fitting for this company. Their creative tactics were more successful than the company itself. It is too bad the workers didn’t directly benefit from their picketing but it is a lesson to all to stick up for themselves. Maybe the picketers on Wall Street can learn a thing of two from the UNITE. I chose to visit Sephora (the cosmetic store) in Union Square. Immediately the space draws you in from the street. The friendly and overdone-up sales associates make the customers feel comfortable in the space and also they make you want these products. They offer samples to draw in customers and they are also instructive as to how the products work. The brightly light signs displaying the designers names invites the customer to pick up and explore the products more closely. The layout of the store also allows for maximum exposure to the prodcuts. And the large images of beautiful people displayed makes everyone desire the products so we can look just like the models so prominently displayed in these photos. As we have learned in the article “The sourcing of Secondhand Clothing” the supply and demand of used clothing is driven by image and fashion. Traditional Western clothing is purchased and shipped to the East and adapted to their culture. This is an interesting concept to me because many of use as well, probably assume that our clothing donations were actually being resold by organizations such as the Salvation Army. With the proceeds they receive from the reselling of the secondhand clothes I assumed they feed the poor. I never thought about the end of life cycle of clothing. I agree with the article when the author discusses the cycle of second hand clothing being a “win-win” with everyone involved. I think the resale of second-hand clothing to such places like Zambia is beneficial to the U.S. in so many ways. It completely eliminates the American consumers’ concerns with what to do with an article of clothing when it becomes completely unwearable and they are also helping those in need. If we can continue and prolong the life cycle of these articles of clothing then ultimately we can reduce the waste in our landfills as well as help the poor.